Big box book business Borders been buried. I couldn’t care less. In both my real life and virtual one I have recently heard remarks about what a shame it is that retail book giant Borders is no more. This mystifies me to no end. I’ll admit that I haven’t been a book consumer since I was a kid, but to lament the demise of a large, warehouse styled retailer in any specialty market practically draws a question mark over my head. Do you know what I miss? The little bookstore that used to be where the shopping mall was build which, in turn, got torn down a couple of months ago to make room for condominiums. It was a place where the old man who owned the place would sift through dusty shelves with you chatting about your favorite author with a twinkle in his eye. Man, oh man, was that twinkle ever contagious! If you wanted a book that wasn’t there, not only would he offer to find a copy for you, but he’d recommend something you might enjoy to help pass the time. Heck, sometimes he’d even give you a copy. And the smell! Oh, Lord, that heavenly smell of ten tons of pressed wood pulp, age, and wisdom. Do you know what else I miss? That dark coffee shop two doors down from the book store that played French indie folk music where everyone wore sunglasses and everything had the faint aroma of cannabis; The comic book shop across town where the superhero otaku would unabashedly stare slack jawed at any female bold or lost enough to dare enter; That cluttered game store over the bridge where the wooden block puzzles were stacked as high as the various editions of Monopoly. What do people think of when they reminisce about Borders? All the name brings to mind is 1,000 identical retail locations scientifically arranged for maximum product placement, standing mutely behind a college kid making minimum wage while he types on a computer kiosk using the same web page I get on my phone, a couple of half-arsed eBook readers, and the blood of the small business owners who lost not just their livelihood, but their dreams. I also remember how everyone remarked what a shame it was that these large companies were forcing our local, privately owned bookstores out of business and that they would never shop there. The bathrooms were always clean and well marked, I’ll give ‘em that. Wait a minute! Maybe I’ll do a eulogy for Borders after all! 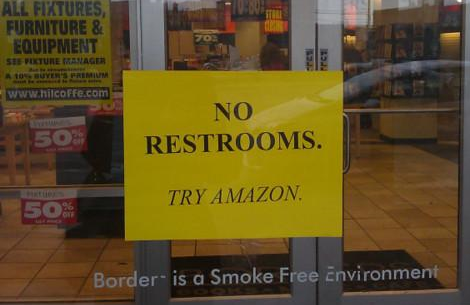 Ahem… Farewell Borders. Thanks for always having a clean place for me to pee.